A warmer-than-average spring will be in store for a large majority of the northern United States, according to an updated March-May 2016 temperature outlook released by The Weather Company's Professional Division on Wednesday. March is now expected to feature well above-average temperatures for the northern two-thirds of the Lower 48. For the spring as a whole (March-May), temperatures are forecast to be the farthest above average from the Northeast region westward into the Midwest, northern Rockies and Pacific Northwest. Parts of southern/central Texas, southern New Mexico, and the Florida peninsula are the only locations expected to experience generally cooler than average temperatures this spring. 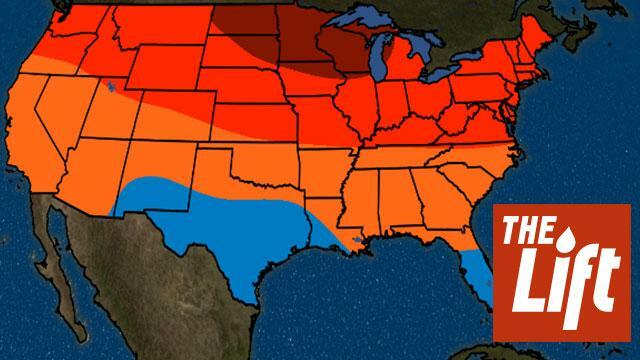 March through May temperature outlook. Areas in darker orange/blue colors represent a greater chance of warmer/colder than average temperatures. However, it should be noted that spring is usually marked by large changes in temperature over a short period of time and the above forecast is the overall temperature trend expected over the next three months. Therefore, even in areas where above-average temperatures are depicted there will likely be periods of colder than average temperatures at times during the spring and warmer than average temperatures will be experienced at times in areas where generally below-average temperatures are expected. Even though El Niño peaked earlier this winter and will continue to weaken over the next few months, it will still influence the overall expected temperature outlook of the contiguous United States through spring. This is due to a persistent jet stream dip in the north Pacific - a feature typical of El Niño - which will likely limit the duration of any cold weather patterns that do develop this spring. According to Dr. Todd Crawford, chief meteorologist at The Weather Company's Energy division, "As we head into the late stages of this historically strong El Nino event, most of the objective guidance is depicting widespread global warmth going through the spring into the summer. The long-range forecast models are unusually consistent in their message for the spring and early summer. Both the National MultiModel Ensemble (NMME) and the European forecast model (ECMWF) show an incredibly similar signal of warm-north, cold-south into early summer." Here is the temperature forecast breakdown by month. Areas in darker orange/blue colors represent a greater chance of warmer/colder than average temperatures. The updated forecast for March now indicates a much milder month for parts of the central and eastern states. A large area from the Great Lakes to Upper Midwest and northern Plains is forecast to see temperatures the farthest above average. The first glimpse of those mild temperatures will be felt this weekend and next week, with some states in those regions seeing temperatures more than 20 degrees above average. Also, now much of the South, Ohio Valley, and mid-Atlantic is forecast to see warmer than average conditions in March. This is a change from the forecast issued in mid-February which called for below-average temperatures. The lone exception is the Florida peninsula, which is expected to see a slightly cooler-than-average March. The warmth is likely to persist through the northern tier. However, the chance for significantly warmer conditions will be centered from the Midwest and Northeast. Cooler than average conditions are most likely in the southern Plains and Southwest. Once again, most of the contiguous U.S. will see warmer than average temperatures during May. Much-above-average conditions are expected to dominate the northern tier from the Northeast and Mid-Atlantic into the Midwest, the northern Plains and Pacific Northwest. The exception to the anomalous warmth will be from portions of the southern Plains to the Gulf Coast and into Florida.